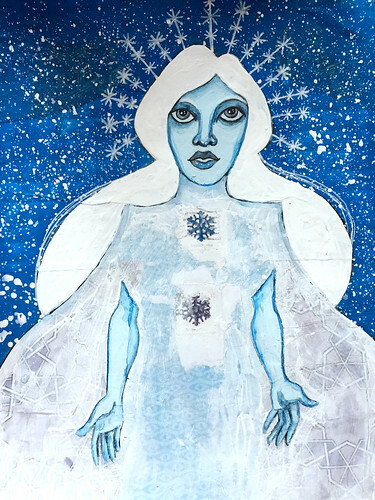 Your Frosty painting certainly depicts the cold happening in your part of the country, but she does have a hopeful look. Get better soon. Thank you. The only upside of being ill is that it has forced me to leave some jobs for another time and, therefore, have time for puddling around in my art journal. Snow gueen? She does look cold and so I’m I. really would like an early Spring. I am glad the piece communicates a sense of cold. I am going to be desperately looking for signs of Spring. I recognize her. She wandered past our house last night, leaving a (very rare) snow behind. I have been seeing lots of photos from folks back home about the snow having walloped Britain. I hope you and Wild Thing are tucked up cosy indoors. All’s well here, thanks. The snow’s already melting. Thank you. I’m getting there. I think she’s very successful in portraying cold. And I love the subtlety of the patterns. Thank you. Yes. Fully recovered now. Well hopefully you’ve finally got out from under winter by now! I do like the frosty effect though, very chilly! Yes, thankfully it finally feels like Spring.